Who wouldn’t want a 5’11 Homer Simpson hanging in a wreckingball from your house? The Idea? Isn’t that obvious? Mythbuster. Enough said! I am not good at sculpting, so I went out on the interweb and downloaded a free #D model. The best (free one) I could find was in blender format. So, I had to install blender. Blender is a freeware 3D modelling tool. I have no idea how to use it, but after 10 minutes I succeeded in exporting it to STL format. 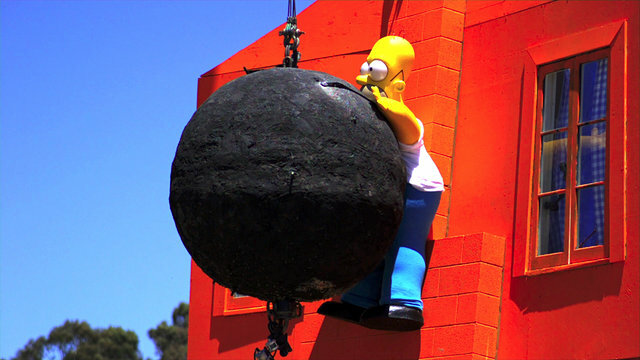 Now, my plan is to slice this model and make a life-size Homer Simpson model slice by slice, carving them one at a time from foam. In order to do that, I need to be able to import it into my CAD program, which unfortunately was not able to import STL. After some googling around, I found some freeware called meshlab. 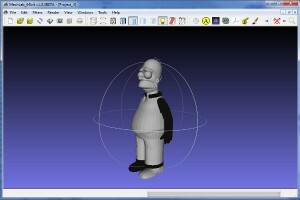 Meshlab can import STL and smooth out the model, as well as export it to DXF. It took some time, but finally I have a file format I can slice.